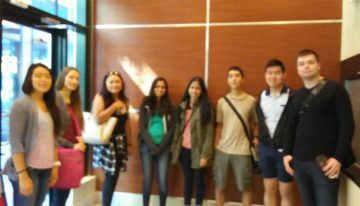 On July 25th, 2017, the CBR summer students ventured down to see behind-the-scenes action at the netCAD Blood4Research Facility at UBC. The students were given a tour of the facility that focuses on blood research, with the aim of being at the forefront of transfusion medicine. The work at netCAD revolves around their set-up as a miniature blood donation centre where they design, develop, and validate new products, processes, and instruments for transfusion. NetCAD works in conjunction with many groups including scientists from Canadian Blood Services (CBS) and across the globe, biotechnology, and medical device companies. Two of the most interesting things that we discovered at netCAD were how blood is separated prior to being given to recipients and how stem cells can be extracted from circulating blood. Through netCAD’s machine testing and implementation, a single unit of donated blood can be separated into its components and go to different people depending on their need. In addition, stem cells can be extracted from donors by giving them a drug to stimulate stem cell production and then extracting the stem cells from donated blood. Essentially, we have the potential to help multiple people with each blood donation! Visiting netCAD was a great experience for all of us summer students, especially since many of us are blood donors; we can relate what we learned to work, as well as our everyday lives. Our visit also emphasized the importance of donating blood and doing a stem cell swap because you never know – you could just save a life by being you! The tour of netCAD was given by the facility manager, Janet. We extend a big thank you to her for taking the time to show us around!